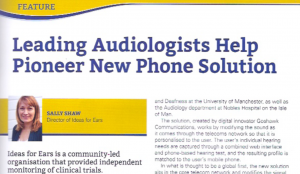 Over the past four years, Ideas for Ears has worked alongside a UK innovator, a major telecoms company, leading audiologists, the Isle of Man Health & Social Care Audiology Department, and people with hearing loss, to support pioneering work to introduce a ground-breaking new phone service. The resultant service will be launched to people in the UK this summer under the brand name Audacious. It was launched in September 2018 to people on the Isle of Man as MT clearSound. Two clinical trials were run to scrutinise the effectiveness and ease of use of the phone technology. This was done by people with hearing loss. Both trials resulted in evidence to suggest it can significantly improve the clarity of phone calls for those with mild, moderate and severe hearing loss. The unique phone solution was created by award-winning UK innovator Goshawk Communications. It works by modifying the sound as it comes through the telecoms network so that it is personalised to the user. The user’s individual hearing needs are captured through a combined web interface and phone-based hearing test, and the resulting profile is matched to the user’s mobile phone. It was made possible thanks to unique algorithms created by the Emeritus Professor of Auditory Perception at the University of Cambridge, Brian Moore, with support also from Dr Michael Stone of the Manchester Centre for Audiology and Deafness at the University of Manchester, as well as the audiology department at Nobles Hospital on the Isle of Man. In what is thought to be a global first, the new solution sits in the core telecom network and modifies the signal as it is being transmitted. It is a software solution that is technology-agnostic: users do not need to adapt or alter their telephone hardware to receive the modified sound. The algorithms created by Emeritus Professor Moore determines how the sound should be processed in different frequency ranges. Two clinical trials have been carried out on the Isle of Man, overseen by Stephen Griffiths, Head of Audiology at Nobles Hospital, and independently monitored by Ideas for Ears, a social enterprise that specialises in supporting the development of hearing-related products and services. The first clinical trial, which concluded 27 January 2017, resulted in strong evidence to suggest that the technology can assist people with hearing loss to enjoy improved call clarity and speech intelligibility and that the audio processing system is technically robust. The second clinical trial, which concluded on 12th September 2018, repeated these findings. The system is now in line to receive Class 1 EU Medical Device Directive Certification. (2016/17)41 participants with some degree of self-reported hearing loss and aged 33 to 85 years. (2018)56 participants with some degree of self-reported hearing loss and aged 41 to 91 years. Voice calls were improved 92% said it was easy to understand people on the phone when using the system. 85% said clarity was better on all, most or some calls. 90% said they found it easier to hear and understand calls when using the system. 87% said clarity was better on all, most or some calls. Positive impact on well-being 58% said they felt more relaxed when using the phone. 54% said it made longer calls less tiring or taxing. 54% said they felt more confident when using the phone. 80% said calls felt stress free while the service was active. The number who said they find making calls tiring dropped from 61% to 16% when the service was on. Those finding calls enjoyable increased from 56% to 80% when the service was active. Users recognised the benefit 81% said they would like to continue using the service. 88% said it should be available to everyone who has a hearing need. 78% said they would like to continue using the service. 89% agreed it should be available to everyone who has a hearing need. The Goshawk solution is aimed at people with moderate to severe hearing loss, especially those with age-related loss. Evidence from the trials, however, suggests that there could be benefits beyond the ‘moderate to severe’ target group. There was an indication that people with mild loss could experience an improved crispness and clarity of sound, and there were also signs that benefits could extend beyond the user to e.g. their family members, colleagues and others, because phone conversations became easier for them too. The new solution is likely to be less effective for those with very severe or profound loss, as the high level of output required can result in distortion. It is also less likely to be a solution for those with cochlear implants, as the algorithms are not designed for listening electrically rather than acoustically. It should also be noted that not all trial participants experienced an improvement. A small number (7.2%) discerned no noticeable change between the standard sound and the enhanced sound, and others (2.1%) found that the enhanced sound made things worse. There were enough data to permit conclusions to be drawn as to why this should be the case. It possibly may be linked to the nature or severity of hearing loss, fit of hearing aids, cognitive health or other factors. It is understood that Goshawk Communications will further explore this. It is a self-use solution designed to allow people to access and safely use it without requiring assistance from hearing care professionals or a mobile phone service provider. Create a hearing profile by performing a short hearing assessment using their mobile phone and a website that they view on a separate device. Listen to audio clips so they can set the volume to a comfortable level and hear both the processed and unprocessed sound. Decide if they want to save the profile so the sound signal to their mobile phone immediately starts being processed. They can hold the phone to their ear in their preferred way, with or without hearing aids and with or without a headset or streaming to hearing aids. They can repeat the hearing test any number of times e.g. to try different ears, holding the phone a different way, changing the handset volume. They can log in at a later date and repeat the hearing test whenever they wish. UK entrepreneur Matthew Turner came up with the concept 11 years ago having experienced poor quality voice calls that were hard to discern. As a hearing aid user, he knew the value of personalised sound. He also knew of the physical awkwardness of placing a phone receiver to a hearing aid microphone. The first proof-of-concept trial took place in 2015/16 and was funded by the Wellcome Trust. 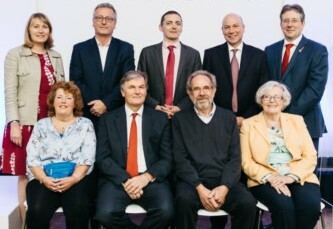 It took place on the Isle of Man, where support was offered by telecom network provider Manx Telecom and the Health and Social Care Audiology Department. The trial’s success led to Manx Telecom becoming a majority shareholder in Goshawk Communications, the company Matthew set up. A second clinical trial was launched in June this year to further test the efficacy of the solution. The technology has now been launched on the Isle of Man, where it is known as MT clearSound. It is a SIM Sim-based mobile phone service available to Manx Telecom customers at no extra cost. In the UK, a deal has now been signed between relevant parties to allow the service to made available to people in the UK via the EE network. It continues to be referred to as “the Goshawk product”, whilst it waits to be named and made ready for launch in 2019. A variety of new phone solutions have emerged over the last few years, creating new options for people with hearing loss. Hearing aids can now connect, either directly or via an intermediary streamer, with smartphones. Software app-based solutions are available and once downloaded can process and personalise audio in a similar manner to the Goshawk/Manx Telecom solution. Also emerging are app-based solution that offer speech-to-text transcription live during a call to permit the user to hear and read simultaneously. There is also the Next Generation Text Relay Service. On top of this, there is, of course, a wide and growing array of hardware solutions – different makes, models and types of phones, with a variety of amplification, telecoil compatibility, and tonal control options. All have merit. However, if you are a hearing-impaired user who simply wants to pick up the phone and use it in the standard way, without the need for purchasing a new phone, or downloading software, or using additional equipment, and who also doesn’t have Bluetooth hearing aids, then currently it seems that only the Goshawk/Manx Telecom solution can deliver this. In 2017, 1,100 people responded to a survey by Ideas for Ears about phone use. Respondents self-reported their hearing ability in their better ear: 27% had good hearing; 22% had mild hearing loss; 41% had moderate or severe loss; 10% had profound or total loss. People with moderate to severe loss in their better ear were most desiring of a solution. Of the 404 respondents in this group, there was clear evidence to suggest that most are finding phone calls challenging. A UK-wide launch will take place in summer 2019. It will be available from new telecoms company Audacious.